Here you'll find a list of additional services, which all our guests at Pension Neuer Markt are able to use. WATCH OUT! DIREKCT BOOKING DISCOUNT! For all guests who book directly with us (via homepage, mail, telephone or on site) we grant you as a thank-you 10% discount per night on all your additonal services (e.g. garage, beverages, guest bus). Maximum 70% discount is possible. Be smart and book directly here with us! At our hotel bar in the breakfastroom we serve alcoholic and non-alcoholic drinks as well as light snacks around the clock. End the day with a chilled beer or a glass of wine and enjoy the unique ambiance of our pension. For convivial TV-evenings – football matches, Vienna Opera Ball, etc. - we have a TV ready for you at the hotel bar. If you'd rather spend the evening in your room, just take your drinks with you and enjoy them there. The car park is just 7 minutes away from the guesthouse. Get your parking ticket at a lower price at our reception, before entering the car park. This cheaper ticket is only available at Pension Neuer Markt. If you need any help, just ask our receptionist. Maybe our shuttle bus is close and able to help you. If you need an airport transfer, we will be pleased to organize it for you. Our own shuttle bus is a modern equipped, air-conditioned bus for 8 guests. Please leave us with your reservation your arrival time and the number of your flight, to make sure we are able to pick you up in time. Of course we bring you back to the airport at the end of your journey too. Have an exclusive look behind the scenes and take a tour with the famous Wiener-Fiaker, a horse drawn cab and explore the city. As a guest of ours we are able to offer you a special price! This tour is unique in Vienna and only offered to our guests. You are able to follow the horses and the coachman for one hour from the stable to the beginning of their workday at Stephansplatz. At 8:30 am you will be picked up by our driver from the bed and breakfast, taken through the city centre and along the Donau, where you can see the highest buildings in Vienna. You will arrive at the stable at about 9:00 am. Now you have the unique chance to see the modern stables and how the horses are put on to the cab. After a short sightseeing in the stables, you will board the Fiaker and enjoy the most beautiful way to work – the coachmen's one. You will drive through the Prater – the former imperial hunting ground – via the Ringsstraße to the city centre. The tour ends about 10:10 am at the Stephansplatz. The Prater-City-tour is bookable during the whole year. In wintertime you will have blankets and closed cabs to prevent you from freezing. The Prater-City-Tour is exclusively bookable for guests of the Pension Neuer Markt and the Pension Dr. Geissler. In the middle of the 19th century the Wiener Ringstraße was built in place of the old city wall. Alongside the 6 km long boulevard, more than 25 historical buildings of different styles have been built. This tour starts with our guest bus straight in front of our door or with the sightseeing tram at station Schwedenplatz. 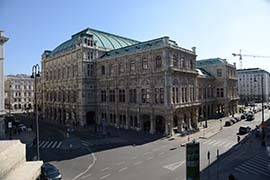 The official Vienna Card offers you more than 210 discounts at museums and sights, theatres and concerts, in shops, cafés, restaurants and the ‘Heurigen’ wine tavern, as well as free travel by underground, bus and tram for 72 hours. The Vienna Card is available at our reception. On the ground floor you will find the restaurant "Henry - the art of living". You can arrange your own dish from a cold and hot buffet, just as you like it. The price depends on the weight. Or you can order the day menu on a very good cost-performance ratio. After there aren't many seats, we welcome you to enjoy the food in our breakfast room, where we serve drinks too. If you would like to have the dishes on the hotel bill, we will hand you a voucher at the reception. Enjoy your meal!